This is the most magical book, written by Caroline H. Mallon with pictures by Mary Gehr. This is a first edition of a very hard to find book, published in 1945 by The Children's Company of Chicago. This book is has a tattered spine but it doesn't affect the integrity of the book itself as all pages are firmly attached. There are the usual scuffs on the corners and edges. It's hard to explain just how dreamy these gorgeous illustrations are! 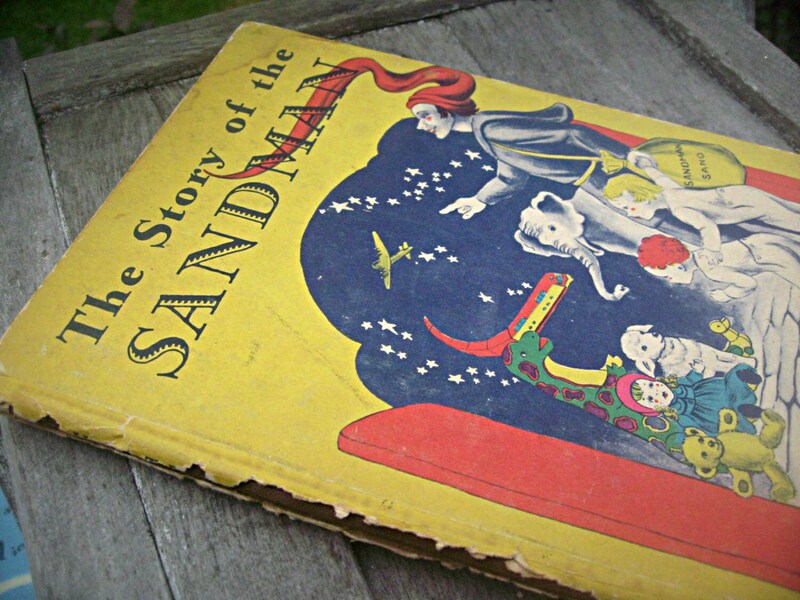 It's the story of Ann and Mickey and there adventures after meeting the Sandman as they were going to sleep one night. The Sandman transported them, with the help of the Wind, and up they went into his Dreamboat and up to his castle. Book measures 7 1/2x10 1/2" with 30 pages. This is one of the prettiest children's books I've seen yet, the perfect story for right before bed! There are several pencil marks on the pages in the back of the book, but luckily those are all blank so the marks aren't covering any of these wonderful illustrations. However my price will reflect the fact that it has these marks. I'll also be listing Caroline Mallons's companion book, "The Story of the Man in the Moon".